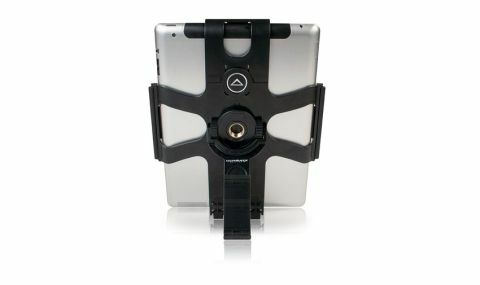 iPad music-makers need look no further for their stand solution. It's reliable, adaptable and a bargain. As the iPad's processing increases and its range of apps grows more enticing, it finds itself increasingly propped up in studios and on stage. For many reasons - creative chaos in the studio, crowd chaos while playing live - you need your pad to be sturdy, responsive and flexible so it can adapt to other equipment. "For the studio, the desktop clamp and sturdy gooseneck attachment are lifesavers for hovering the 'Pad over a synth"
There's no shortage of stand and clamp accessories for iPad, but their set-and-forget nature means you've got to find the perfect spot and keep them there. This isn't always possible with an ever-changing stage setup or given the flexible functions of the iPad in the studio. Ultimate Support's HyperPad 5-in-1 iPad stand solves all these problems with one solution. Putting the HyperPad together is a bit confusing - there are plenty of brackets, holders, screw parts and grips to deal with - but once you do you can fasten your perfect solution quite quickly. For the studio, the desktop clamp and sturdy gooseneck attachment are lifesavers for hovering the 'Pad over a synth. The gooseneck can also be attached to the top of a mic stand for plenty of positioning flexibility. A landscape and portrait mic stand attachment and a table-top kick-stand complete the 'five' functions (though really it's four).